The species' Latin name "hyemalis" translates into "winter;" and the genus name, Junco, roughly means "bird of bushes or reeds" - referring to their preferred habitats. The Dark-eyed Juncos (Junco hyemalis) are also referred to as "Snowbirds" as they breed in North America (i.e., Alaska and Canada) and migrate in large flocks to the lower United States, Mexico or Central America for the winter. They expansive range stretches across most of North America - the subarctic taiga in the north through the United States to the high altitude mountain forests in Mexico and Central America. Southern populations are sedentary (non-migratory) except for some altitudinal movements to avoid severe weather conditions. Those breeding in the northern parts of this species' range migrate south for the winter - with a wintering range that stretches from Mexico through to the Central American country of Panama. Depending on their range, they can be found in subarctic taiga (boreal forests) and high altitude mountain forests; but may also be seen in fields, parks and backyards. They mainly eat insects and seeds. These birds nest in well concealed locations either on the ground or low in shrubs or trees. 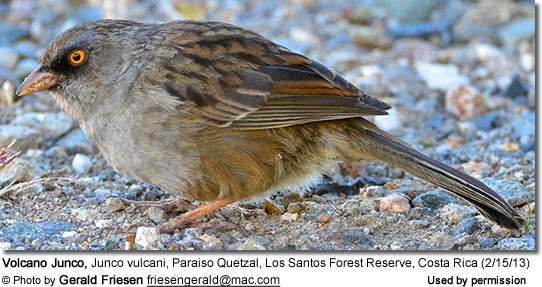 These small, sparrow-like birds have an average length of 6 inches or 15 cm. The plumage ranges in color from various shades of grey to grey-brown, with conspicuous white outer tail feathers, and either a grey or blackish head. The short, conical (cone-shaped) bills are well adapted for crushing seeds. They are either pinkish or whitish in color. Described as snapping, twittering or fast trills that are reminiscent of the rattling of small ball bearings. Range: Breed in the North America - specifically in the taiga forests of Alaska to Newfoundland and south to the Appalachian Mountains. Migrate south for the winter. Range: In the Black Hills of South Dakota and Wyoming, United States. Range: The Pacific coast mountains from southeastern Alaska to California. Wintering in the western part of Texas. Range: Northern Rocky Mountains from southern Alberta to Idaho and Wyoming. Range: Southern Rocky Mountains from Colorado to central Arizona. Range: Mountains of extreme western Texas, northern Arizona and New Mexico. Range: High mountains of Mexico, southeastern Arizona and southwestern New Mexico. Range: High mountains of Chiapas (southeast Mexico) and Guatemala. Baird's Junco (Junco phaeonotus bairdi). Range: High mountains of Costa Rica and Panama.